Welcome to the Okinawa Karate News website. The 150th issue of our monthly newsletter was released in March 2019! Enjoy our bilingual newsletter either in a printed version or as an online PDF version. Join the many readers of Okinawa Karate News and stay tune to the Okinawa Karate Kobudo community. 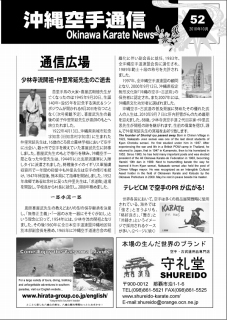 Click here for the Okinawa Karate News PDF VERSION TRIAL! If you happen to come to Okinawa, you can pick up a copy of the newsletter at the Shureido Store in Tomari where it is freely distributed as a service to visitors. Or you can contact us anytime if you need any services related to karate! As we say and think, Simple Is Best. That's the way we like it. Now, it's up to you to enter the world of Okinawa Karate and Kobudo. Okinawa Shogaku perfomed karate in Miyagi Pref. Karate seminar at Sri Lanka largest leasing Corp.
Do you know about Commotio Cordis? Copyright 2010 Okinawa Media Planning All rights Reserved.